Like to kill mutants and evil robots out of your way? Great, who doesn’t! 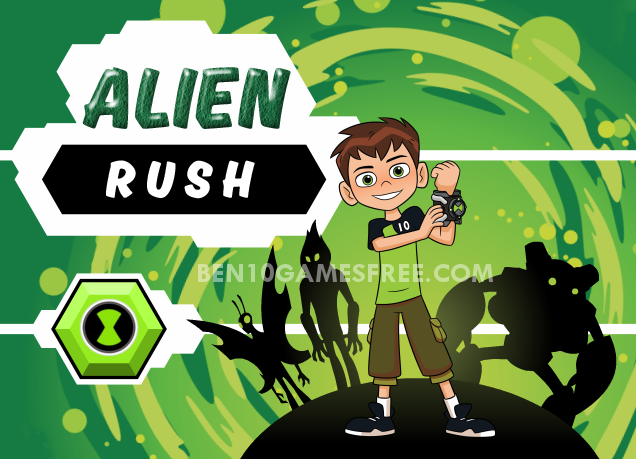 Here’s another exciting online game for all ben 10 fans – Ben 10 Alien Rush. With aliens attacking Ben, you gotta help him complete his run killing all that comes in the way! Read to play Ben 10 Alien rush online? Wait let’s have look what’s coming your way. The game is simple ben 10 running game. Destroy the aliens, collect the coins and reach the finish line as fast as you can! Easy right? Well not much as it sounds. Ben 10 Alien rush game is all about running in the right direction at the right time else the alien attacks will kill you down in no time. But don’t worry, if your enemy is powerful, so is Ben 10 with his aliens like Heatblast, Overflow and Big Chill. Recommended: Play Ben 10 Alien Device Game online now! Ben 10 Alien Rush has three levels each having three sub levels i.e. 9 levels in total. In the first three levels, Ben runs through a river with alien water creatures that attack. The only way to reach the end is to avoid or destroy. To avoid them you have you run in such a way to escape the fired bullets and to destroy these creatures you have to counter-attack and kill. At the end of the third level of Ben 10 Alien rush game, you have to defeat the evil water monster by repeatedly attacking it and avoiding when it attacks Ben. The second three levels are where Ben rushes through a valley full of enemy shooters. You have to make Ben reach the end escaping all the shooters and their bullets. Again, when you reach the 6 level, you will face an evil Bee monster which you have to kill to move to the next three levels. In the last three levels, Ben 10 rushes in a never-ending football field and there are joker firing guns and even boxing. Kill these jokers and reach the finish line. Remember, at the 9th level, Ben has to face the evil joker who throws bog bombs on you. Pro tip: Long Press X key to use more powerful attacks. That’s all about Ben 10 Alien Rush game. Now you are completely ready to kick some aliens and rush to the finish line to complete the game. 9 levels and several aliens. Help Ben to kill them and finish the game! Good Luck. Don’t Forget to give your rating for Ben 10 Alien Rush and share your tips and tricks to win this game in the comments section below.